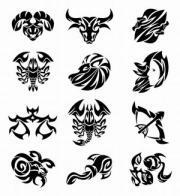 If you happen to be an Aquarius and you're looking for something a little different than the average zodiac tattoo, conside an Aquarius tribal tattoo. Combining the two elements in one design can give your body art a unique perspective. As the 11th sign of the zodiac, there are numerous tattoos and astrological symbols that someone might get to honor Aquarius. There are three main symbols that represent the sign of Aquarius: the Water Bearer, the Glyph (two parallel and wavy lines), and water itself. Each of these images brings in a different side of the sign. The Water Bearer is the classical representation of the sign as a liberal humanitarian. The water is a representation of the weight and duty Aquarius has towards others. The masculine images of the Water Bearer himself connects the sign to a powerful and flexible individual. Even the flow of the water from the jug is symbolic of the role the sign takes in controlling motions. The Glyph is perhaps the most popular tattoo symbol of the sign. The two lines represent not only the flexibility that is present in Aquarius, but water itself. Whether the water is symbolically flowing out of the jug or moving in the ocean, Aquarius is dedicated to evolution. The motion of water is a great symbol for the sign. Combining this with the Aquarian element of Air, water symbolizes the agility in Aquarius. Whether debating or choosing clothes, Aquarius is always witty and quick to the punch. Tribal tattoos are popular in the world of ink. Tribal tattoos are usually dark in color (and very often just black) and involve abundant line work. 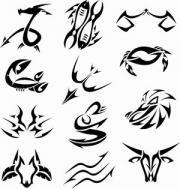 Instead of being elaborate and realistic, tribal tattoos are normally ornamental and suggest only the basics of a design. Tribal ink also balances ink with the empty space in a tattoo to create more graphic work. 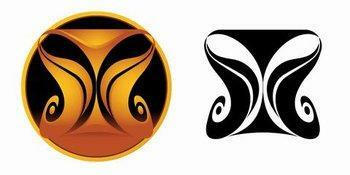 Celtic design tattoos also contain a little tribal flair, although they really are distinct genres in their own right. If you've been thinking of combining traditional tribal elements with Aquarian influences, there are numerous ideas for Aquarius tribal tattoos that you can adapt. Using tribal lines to outline the body and movement of the Water Bearer can make a great upper arm tattoo. You can even use additional tribal or Celtic designs outside of the initial image to create a much larger piece. Since the design is already line based, the Aquarius glyph works great for tribal work. While you can get a simple glyph in tribal lines, you can also mix the pattern up with matching dark colors in the design itself. If you're interested in staying true to a black tribal piece, you can mix the design up by playing with the size and proportions. Perhaps for your tribal piece, the second line in the glyph is larger and tilted. It's your tattoo, so do what you want! Water can be difficult to represent in a tattoo image. However, you can use tribal work to come up with a detailed representation of a moving body of water that stays true to you, tribal tattoos and Aquarius. For a simpler piece, the Water Bearer's jug can be inked in tribal style (see image). You can create your own idea of what the jug looks like. Another idea is to illustrate the Aquarius constellation in tribal lines. Since the constellation is already line based, it lends itself nicely to creating a powerful tribal piece..
One of the most popular types of ink out there are tribals bands. You can nicely incorporate any Aquarius symbol into the middle of a nice tribal armband. If tribal work is up your alley and you'd like to incorporate Aquarius into the piece, you've got plenty of options. Keep an open mind and create a piece that is true to you above all else. After all, you'll be the one with the ink on your body!